The Hirakud Dam is a composite structure of earth, concrete and masonry. 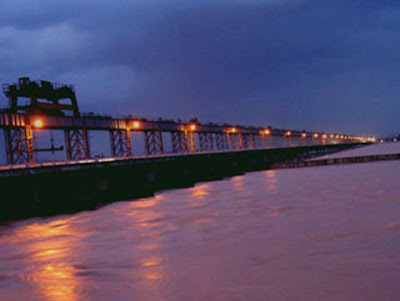 It is the longest major earthen dam in the world measuring 24 km including dykes, standing across the river Mahanadi. The main dam has an overall length of 4.8 km spanning between two hills; the Lamdungri on the left and the Chandili Dunguri on the right. The dam is flanked by 21km long earthen dykes on both the left and right sides, closing the low saddles beyond the ajoining hills. The dam and dykes together measure 25.8 km. It also forms the biggest artificial lake in Asia, with a reservoir holding 743 km² at full capacity with a shoreline of over 640km. 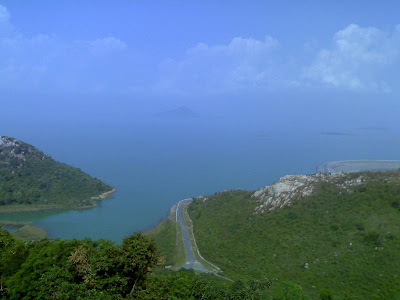 Cattle Island exists in one of the extreme point of Hirakud Reservoir, a natural wonder. It is near Kumarbandh village of Belpahar-Banharpali range which is about 90 km from Sambalpur. By motor launch from Hirakud Dam, it is closer by 10 km via the river. The island is nothing but a submerged hill, and prior to Hirakud Dam construction, it was a developed village. Only cattle inhabit the island. During the resettlement period, villagers left some of their cows and bulls behind; when the dam construction was over the cattle settled down on the hill-top. By the passage of time the nearby area filled up with the reservoir water, turning the hill-top to an island. Being away from mankind, the cattle are now wild, very swift and not easily caught. Living on a hilltop with dense forest, they are larger than tame cattle. Almost all are white in colour. Nearby residents attempt to hunt these animals from time to time, but these hunts are rarely successful. Though descended from tame cattle, these animals provide a contrasting picture of this breed of animal returning to life in the wild.